Was William James a Wimp? 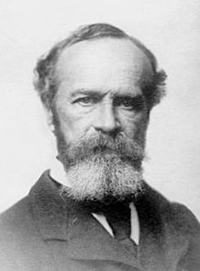 Much has been written about the contributions of Professor William James of Harvard University to early psychical research and parapsychology. It was James who took the lead in organizing the American branch of the Society for Psychical Research (ASPR) in late 1884 and then “discovered” medium Leonora Piper, the primary research “project” for the ASPR, the following year. Without a detailed examination of the research records relating to Mrs. Piper, one might easily jump to the conclusion that James did more than any other researcher to advance the survival hypothesis. The truth is, however, that he probably did more than any other person of that era to impede it. In fact, James (below) avoided discussing the survival hypothesis and remained on the fence relative to it his entire life. His opinions and attitude toward survival no doubt influenced many others who saw him as someone “in the know” and to be admired. Although I was aware of James’s fence-sitting posture before doing research for my book about Mrs. Piper (Resurrecting Leonora Piper: How Science Discovered the Afterlife, recently released by White Crow Books), his antagonism, if it can be called that, really struck a nerve when I went over the records with a fine tooth comb. While other prominent researchers, such as Frederic Myers, Richard Hodgson, Oliver Lodge, and James Hyslop, moved from skepticism to belief in spirits and survival after studying Mrs. Piper, James remained a skeptic to the end, at least publicly. There was no doubt in his mind that Mrs. Piper was not a charlatan of any kind. “…..I am persuaded by the medium’s honesty, and of the genuineness of her trance; and….I now believe her to be in possession of a power as yet unexplained,” he wrote. During the first six or seven years of the study of the Mrs. Piper, James appears to have been the leading proponent for the “secondary personality” and “telepathy” explanations. That is, Phinuit, Mrs. Piper’s “control,” who claimed to be the spirit of an early 19th Century French doctor, was really just a dream personality of Mrs. Piper’s and this personality had the ability to read minds and then dialogue with the researchers and other sitters. When information came through that was unknown to the sitter and therefore seemingly outside the scope of simple telepathy, the theory was expanded to something called teloteropathy, the ability to read the minds of people anywhere in the world, and also to tap into a “cosmic reservoir” or “universal mind,” which stored all memories and thoughts somewhere in the ethers. All of these theories were much later packaged and called superpsi. While Myers and Lodge favored the spiritistic hypothesis over the secondary personality explanation after studying Mrs. Piper in 1889-90, Hodgson, who had become the chief researcher of Mrs. Piper, agreed with James. It was clearly the “intelligent” thing to do at a time when science had supposedly freed itself from the folly and superstitions of religion. To express a belief in spirits would have invited the disdain of mainstream science and all “knowledgeable” people. Myers and Lodge were initially guarded in stating their beliefs in a spirit world, but they were much more forthright than William James. Hyslop, who had been teaching logic and ethics at Columbia, did not come onto the scene until 1899, but soon had his feet firmly planted in the spirit camp. Attempts to verify that a “Dr. Phinuit” had actually existed as a person were unsuccessful and this was seen as supporting the secondary personality hypothesis. However, in 1892, George Pellew, a 32-year-old member of the ASPR, died in an accident and soon thereafter began speaking through Mrs. Piper and sharing “control” duties with Dr. Phinuit. As there was much evidence to suggest that it was actually Pellew communicating, Hodgson joined in the spirit camp. Yet, James seems to have ignored the significance of the Pellew personality. James complained about the triviality of the messages coming through Mrs. Piper, giving no indication that he was aware of the volumes of profound material coming through other mediums and documented by Judge John Edmonds, Professor Robert Hare, Allan Kardec, and the Rev. William Stainton Moses during the previous 35 years—volumes of material that presented a whole new spiritual philosophy. As Hyslop and others pointed out, the trivial messages were the evidential ones, while the profound messages were in no way evidential, unless one considers the fact that the material was often well beyond the medium’s intellect or experience. It has been suggested that, beginning around 1850, advanced spirits attempted to communicate the true nature of reality through mediums, but the world, for the most part, rejected it, since it was non-evidential. Thus, those advanced spirits threw up their hands in despair and turned it over to lower level spirits to work on the more trivial and evidential messages. Thus came Dr. Phinuit speaking through Mrs. Piper. James went on to say that the only thing the religious experience can unequivocally testify to is “that we can experience union with something larger than ourselves and in that union find our greatest peace.” And yet, while claiming that survival was a “secondary concern,” he wrote that “the luster of the present hour is always borrowed from the background of possibilities it goes with. Let our common experiences be enveloped in an eternal moral order; let our suffering have a mortal significance.” James was said to have considered suicide in his younger years as a result of his “soul sickness,” or belief that there was nothing beyond this world. Early in the book, he stated that the “moralist” – apparently the name for the humanist at that time – can get by without religious beliefs until the body begins to decay or “when morbid fears invade the mind.” The logical inference here is that he was referring to the moralist’s fear of extinction and the religionist’s hope for life after death. Still, he continually beat around the bush on the survival issue, disguising it in other verbiage, sometimes alluding to it as the “eternal.” He said that a person should be content in his or her faith that there is a higher power, even if that higher power does not promise life after death. “For practical life at any rate,” he concluded the postscript, “the chance of salvation is enough.” In effect, he was saying that the blind faith of religion is enough, whereas the goal of psychical research was to move from disbelief or blind faith to conviction. Writing in the November 1919 issue of the ASPR Journal, Hyslop, who had known James personally, and, in fact, came to know of Mrs. Piper from him, stated that “James seems to have confused means and ends in the method of determining ethical truth, and also to have wholly missed the basis of scientific truth which may be wider than ethical truth.” That is, James’s pragmatism was sound for ethics, but was not the criterion of fact which is the object of science and philosophy. James wrote that he was willfully taking the point of view of the so-called ‘rigorously scientific’ disbeliever, and making an ad hominem plea, stating that tactically, it is better to believe too little than too much. Reading between the lines of his reports on Mrs. Piper, I suspect that James was more of a believer than he let on, but lacked the courage to admit it, probably feeling that such an admission would have significantly damaged his reputation in the academic and scientific communities. To put it another way, he simply wimped out, as so many others have. Then again, he might have been so stuck in the muck and mire of scientific fundamentalism that he was unable to see the forest for the trees. It seems that the “eternal” held William James’ focus. Perhaps the individual survival simply was of no interest to him and that’s why, perhaps, he did not bother to invest his energy in any definite position about it.? Yours is a great article, beautiful writing, as always, Mike. Thank you for your comments. I agree with both of you. Amos, to my knowledge, none of these parapsychologists who hold to the secondary personality theory ever attempt to address the issue of why all these secondary personalities are pretending to be spirits of the dead. What is their game? Has any one ever admitted to being simply a secondary personality? As Patience said, “I be I and she be she,” or words to that effect. Robert, as you say, they all seem to think it is a black and white situation. I don’t know why they simply can’t say that “the evidence points in that direction” or “strongly suggests survival,” or words along that line. Perhaps even those words will invite the disdain of their peers or cut off funding, etc. Clearly, Lodge’s reputation as a world renowned scientist didn’t fully protect him from the scoffs of his know-nothing peers, but he was not “gutless” as so many of them are. On the other hand, I really believe that most of them are bombarded with so much conflicting information that it does become extremelhy difficult to see the forest for the trees. On an intellectual level I would agree with Braude but it seems like there is bitter tension sometimes between common sense and intellectual logic. Common sense would tell me that there is no way an uneducated housewife could tap into some latent ability to produce award winning literary works without the help of a guiding hand. I am just as baffled as anyone else about this case but is it easier to conclude that a discarnate entity dictated these works or that she was able to write them herself, using a dialect she has never studied or researched simply derived from her own unconscious. Has this ever been proven to be true in any other cases? Was an individual able to pick up a foreign language or skill without actually knowing anything about it? That is not a rhetorical question, I honestly don’t know and would be intrigued to learn more about this. Fascinating, Mike. Amazing how little has changed. As always, another well written post; I wish other writers of the subject of parapsychology would write with your clarity and use of relevant quotes. Sterling post, Michael, and something I’ve been thinking a lot about, stimulated recently by your excellent book on Piper. I incline to the ‘wimp’ view as you state it in the penultimate para, although I would not put it quite in those terms! It just is very difficult for intellectuals and scientists to profess a belief in ‘another world’ without sacrificing their credibility, and their professional status along with it. I don’t think we should be too judgmental about that. On the contrary, I think it’s an area we should be willing to explore more fully. I also think there’s more to it than a simple binary choice. Once can accept the logic of spirit survival and yet balk at the idea of adopting a religious worldview, as James did. He’s one of the most insightful commentators on religion who ever lived. Yet I recall him saying somewhere that he could not imagine personally praying. James’s willingness to record his dithering, in his typically expressive style, gives us an opportunity to understand that very emotional conflict which so many clever people must feel when contemplating the subject, but express in very different - and often quite antagonistic - ways. I’m writing a review for my blog, and will doubtless bang on more about it there!